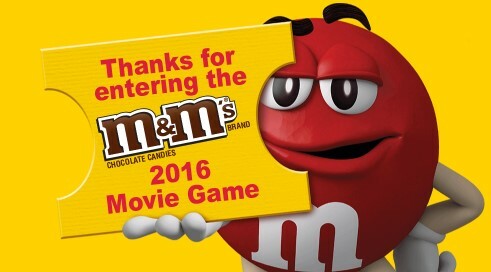 M&M's wants you to go to the movies ON THEM! Enter their text to win game daily for a chance to win free movie gift cards and free movie house concessions for goodies at the theater, too! 1,315 First Prizes: each, a Movie Certificate redeemable at a participating theater for two (2) movie admissions; Approximate Retail Value (ARV) of Each First Prize: $24. 5,497 Second Prizes: each, a Movie Certificate redeemable at a participating theater for one (1) movie admission; ARV: $12 each. 13,928 Third Prizes: each, a $5 Concession Certificate redeemable at a participating theater; ARV: $5 each. 143,846 Fourth Prizes: each, a $3 Concession Certificate redeemable at a participating theater; ARV: $3 each. HINT: To enter every day just send the keyword MOVIE to shortcode 87654. This Sweepstakes ends on 08/22/16 and you can ENTER DAILY to win.